If your HP scanner is not working, don’t worry. This is a common scanner problem and you can fix it quickly and easily. Why is my HP scanner not working? The HP scanner not working issues include scanner won’t scan, scanner not detected by your computer, or errors pop up when you’re using your scanner, etc. The causes for these problems are various and sometimes hard to identify. As you can imagine, the connection problem can prevent your scanner from connecting to the computer, and the software and services problem in your computer are the possible reasons for this issue. But don’t worry. We’ll help you fix scanner not working on HP. Here are solutions that have helped people resolve the same issue. You don’t need to try them all; just work your way down the list. 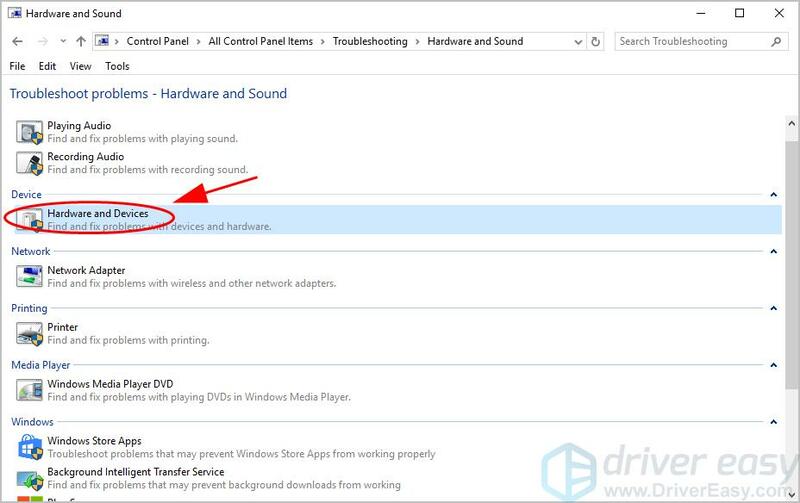 The screenshots below come from Windows 10, and fixes apply to Windows 7 and Windows 8.1. To use your scanner, you need to make sure that your scanner is powered on in the first place. Then you should check the connection issue. If you’re using a USB scanner, check the USB ports and USB cables to ensure it works properly. While you’re using a network scanner, ensure your computer has a good Internet connection, and your scanner connects to your computer under the Internet. In addition, if you’re using VPN in your computer, try disconnecting VPN from your computer and scanning again. If you’ve checked the above steps and your HP scanner still doesn’t work, don’t worry. There is something else to try. 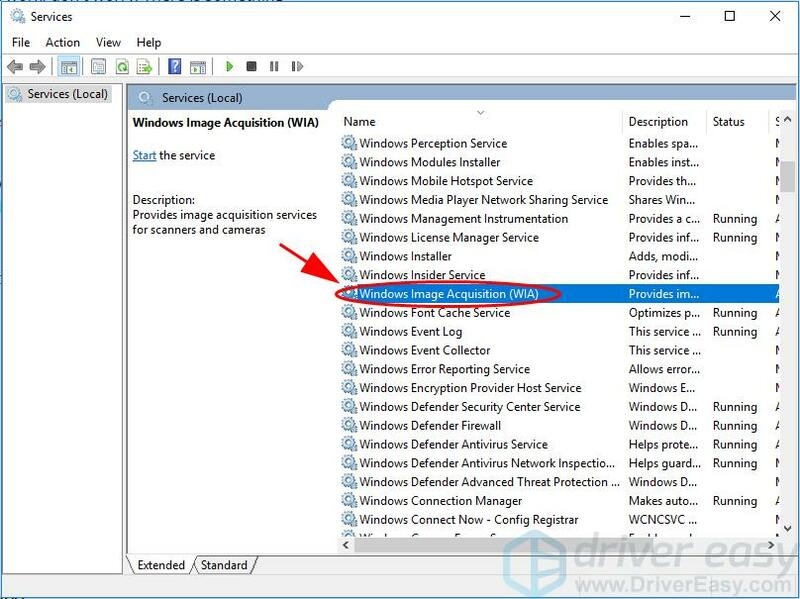 Scroll down and double click Windows Image Acquisition (WIA). In the popup pane, ensure the Startup type is set Automatic, and the Service status is Running. If the Service status is already Running, click Stop to stop the service, then click Start to re-enable the service. Then restart your computer. Try to use your HP scanner again and see if it works now. Ensure these services are set to Automatic and the Service status is Running. 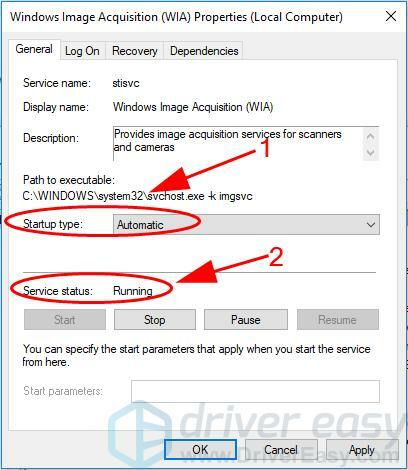 The Windows Image Acquisition (WIA) service is dependent upon the Shell Hardware Detection Service, while the Shell Hardware Detection Service is dependent upon these services: Remote Procedure Call RPC, DCOM Server Process Launcher, and RPC Endpoint Mapper. Save the changes and try your scanner again to see if it works. 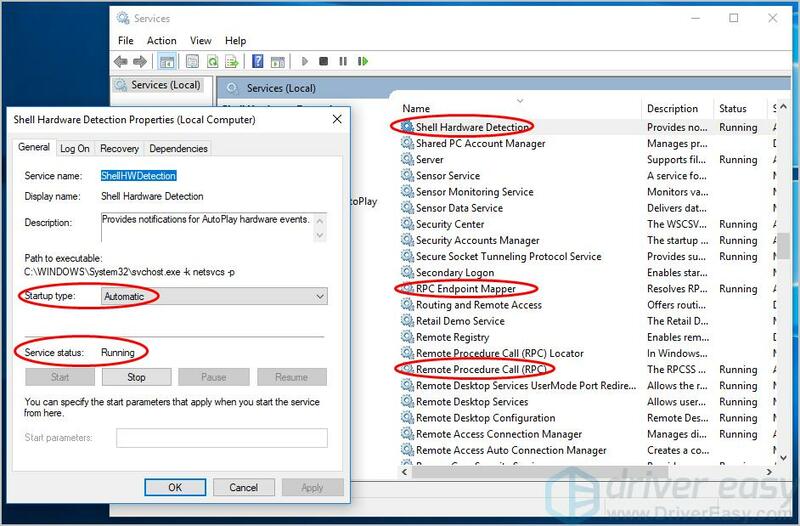 A missing or outdated scanner driver can cause your HP scanner not working, so you should update your scanner driver up to date. 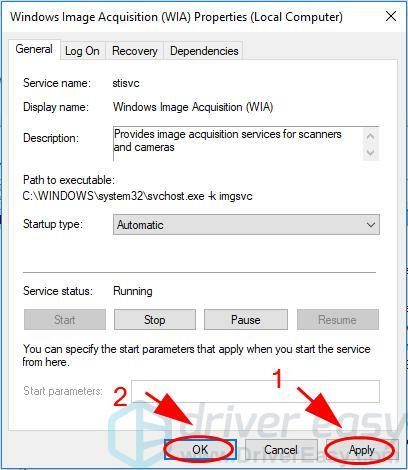 There are two ways to update your scanner driver: manually and automatically. Manually update scanner driver – You can go to the website of your scanner manufacturer, find the latest driver for your scanner, and install it in your computer. This requires time and computer skills. 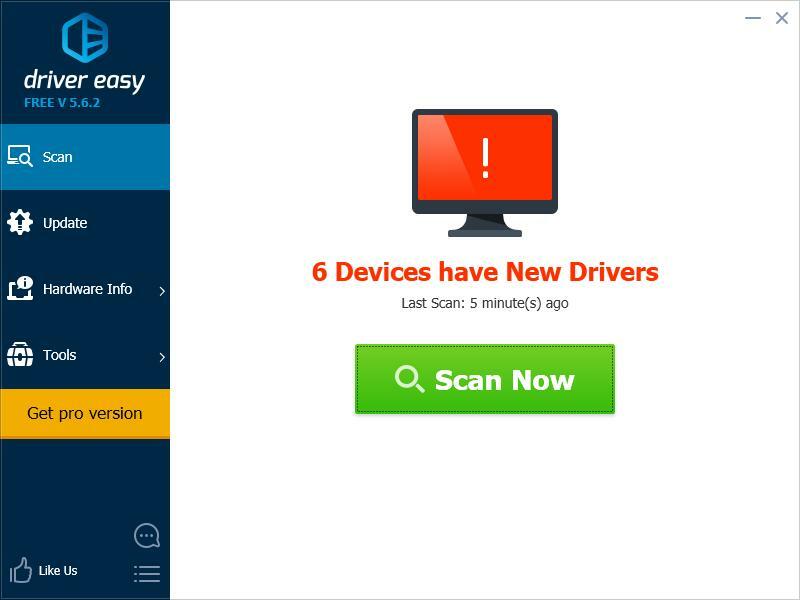 Automatically update scanner driver – If you don’t have time or patience, you can do it automatically with Driver Easy. Click the Update button next to your scanner to download the latest driver (you can do this with the FREE version), then install it in your computer. 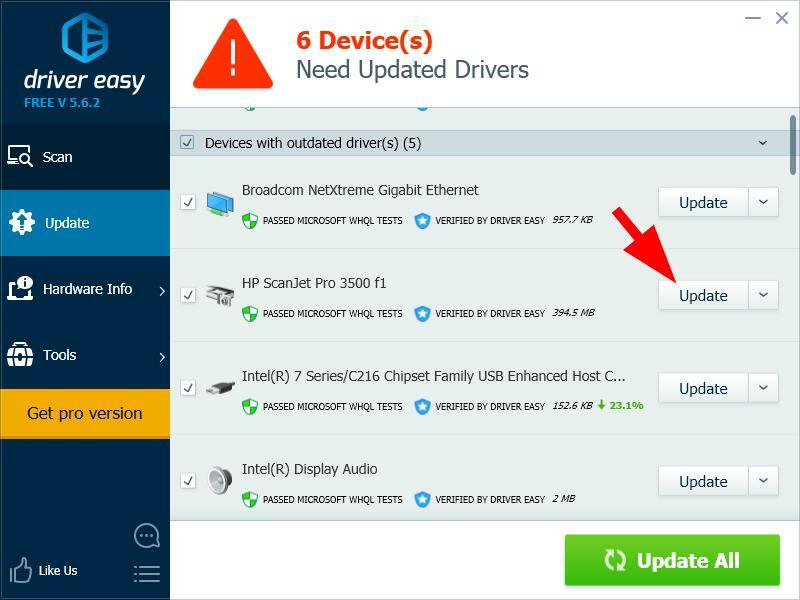 Or click Update All to automatically download and install all problem drivers in your system (this requires the Pro version – you’ll be prompted to upgrade when you click Update All). Then try scan with your scanner to see if it works. It’s possible that there’s something wrong with your scanner, so run a troubleshooter in your computer to fix the issue. 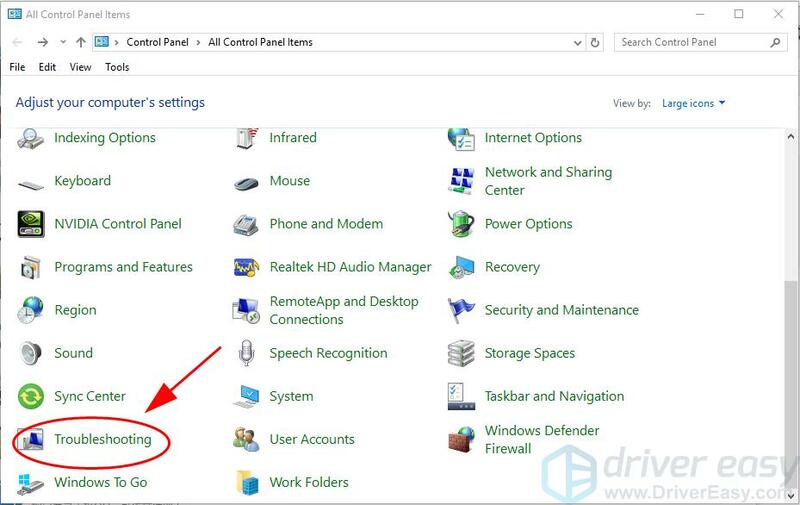 Open Control Panel in your computer, and view by small icons or large icons. 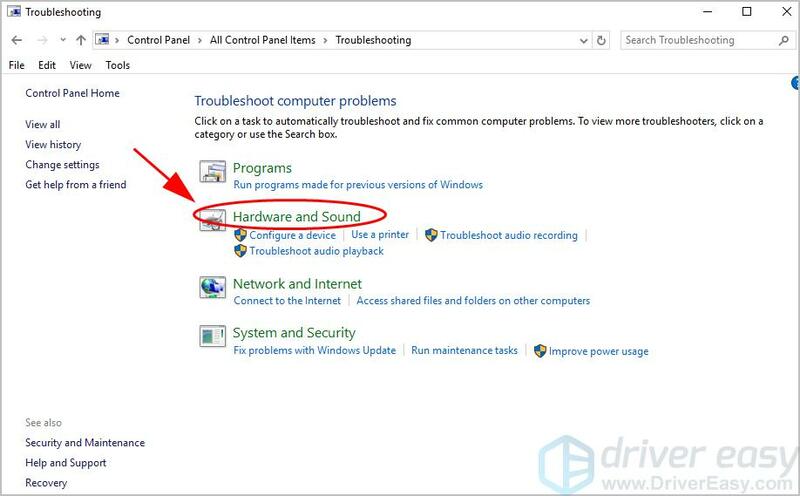 Then follow the on-screen instructions to finish the troubleshoot and fix the detected issue. After that, try your scanner again and see if it’s working properly. System File Checker (SFC) is a built-in Windows feature that scans corrupted system files and repairs it automatically. Your HP scanning is not working because of some corrupted system files, so you can try SFC to fix the problem. 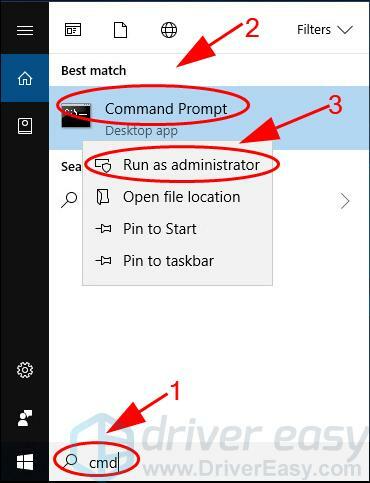 Type cmd in the search box, right click Command Prompt and select Run as administrator. 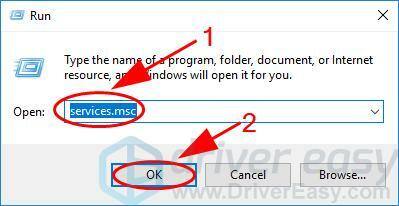 In Command Prompt, type the following command, then press Enter. Then wait for Verification 100% complete. This can take a while. Once complete, Type exit in Command Prompt and press Enter to close the window. Restart your computer and see if your scanner begins to work. So there you have it – Five effective methods to fix HP scanner not working. Hope this post comes in handy and resolve your problem.